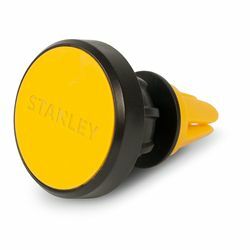 The secret to the STANLEY® Magnetic Car Vent Phone Mount is a thin metal plate that slips between your phone and its case. Once that's in place, it's simple to attach the phone to the vent-attached base with just one hand. FITS ALL PHONES - From small pocket sized phones to large tablet-sized phones, this phone mount fits them all. The secret is the thin metal plate sandwiched between your phone and its case. This highly magnetic sheet holds tightly to the mount for a strong, secure hold. NO CLAMPS NEEDED - This unique mount, when properly installed, won't damage your phone. No hard plastic jaws digging into the sides of your phone, no brackets bending and squeezing your phone. 360 DEGREE ROTATION - With a strong, secure hold using magnets, your phone can easily rotate into portrait or landscape mode for best use of GPS and other mapping apps. SMOOTH ADJUSTMENT - With the ball and socket joint, you can easily adjust the position of the mount for optimal viewing.